The under sink water filter cartridge systems fit underneath you kitchen sink. The water filter cartridges that can be supplied with the under sink water filter are available in standard carbon, heavy metal reduction or as a lime scale inhibitor water filter. Cartridge water filters contain high quality granular activated carbon (GAC) which is bacteriostatic to stop bacteria growth inside the water filter. Our under sink water filters are designed to supply you with great tasting drinking water in your own home. The under sink water filter cartridge systems are supplied with everything you need get going. The kit consists of a flip lever long reach, a cartridge housing with the push fittings fitted at the factory with stainless steel bracket, a spanner and a self piercing saddle valve with the tube attached for a simple water connection and a water filter cartridge. Improves the taste and odour of the drinking water, reduces chlorine, toxins & assorted herbicides & pesticides. Improves the taste and odour of the drinking water, reduces chlorine, toxins, assorted herbicides & pesticides, inhibits lime scale formation but leaves the calcium in the water as calcium is good for you. Improves the taste and odour of the drinking water, reduces chlorine, toxins, fluoride, assorted herbicides & pesticides as well as dealing with a wide range of heavy metals such as lead and many, many more. This top of the range water filter system is also effective against nitrates. Under sink cartridge systems should have the cartridge replaced every six to 12 months depending on water usage. 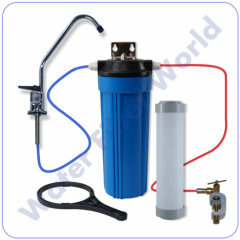 For 2 yearly replacement models please see our under counter water filter range. © 2018 Water Filter World. All Rights Reserved.